Hiring a rental bus in NY is a easy and simple. 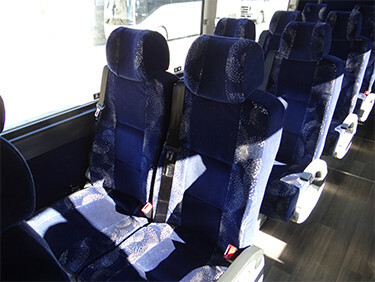 We are dedicated to making your bus trip a comfortable, exciting experience. Whether for school, collages, church groups, business, or any other group, Accord Bus handles every detail to ensure your trip is safe, enjoyable and worry-free. With our well-trained and safe drivers. Select the service you are interested below or simply call us at 212-973-8282 to get a free quote and have all your questions answered. You are guaranteed a maintained, comfy vehicle with modern equipment. Entertainment and safety features make our NYC charter buses the best option for group travel of any kind. The perfect choice for a student field trip, summer camp trip, sporting event or extra-curricular activity. Great bus rates for New York charter bus rentals is a offer you can’t miss. Plush reclining seats w/ outlets for a comfortable drive, even for longer trips. Spacious longer compartments to have sufficient space for a relaxing trip. P.A. System – a crucial part of the safe operation of school buses and a great way to communicate with everybody in the bus. CD/DVD Player so that everybody in the coach bus rental is entertained. Free WiFi so that everybody stays connected to share messages and photos of the sights from the bus. GPS Tracking System allows us to know where each bus is for extra safety. You can trust a screened, experienced coach driver. Our 19a certified drivers are extensively trained professionals and the vehicles Accord Bus provides undergo strict maintenance and inspections. Your safety is our responsibility and ultimate goal. Comfort and safety for your next trip. Looking for a reliable partner for your next group tour, corporate event, wedding ceremony or any other event? To better decide what is best for you, get a free price quote by either calling us at 212-973-8282 or by filling in the free price quote form.